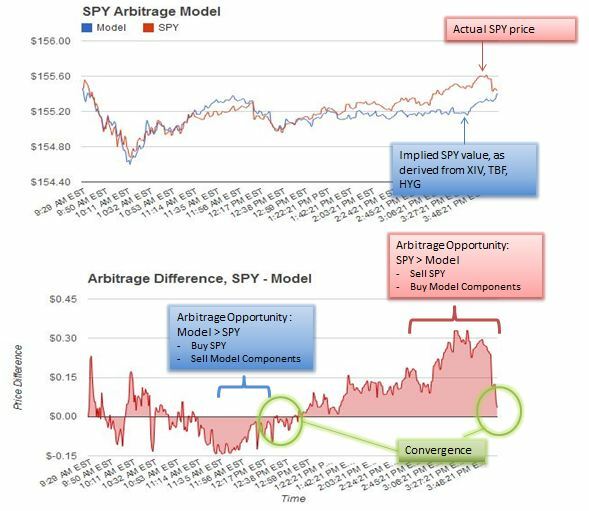 I'm happy to announce the availability of a new trading tool on the Trading Volatility site, the SPY Arbitrage Model. The model is updated in real-time throughout the day, plotting the S&P 500 (SPY) against a model of the implied value for the S&P 500 as derived from a collection of related assets (volatility (XIV), interest rates (TBF), and credit (HYG)). With this model a trader can place relatively low risk arbitrage trades to take advantage of prices as they diverge and recouple during the day. To get the most our of this trade you want to look for points at which the difference between SPY and model are large -- generally +/-$0.20 is a good rule of thumb depending on your trade sizes and transaction costs. On the areas I highlighted above, the second area I highlighted (towards the end of the day) provides a better opportunity than the first, as the difference between SPY and model is $0.30. The trade approach is then to sell the SPY while simultaneously buying the components in the model. Once the SPY and model converge, positions should then be closed. When the arbitrage opportunity opened up in the last hour of trading, two components of the model were lagging (XIV and HYG) the SPY, while TBF was essentially in line. In this case an alternate trade would have been a short position in the SPY, but only take longs in XIV and HYG since it is less likely that TBF would make an upward move while SPY moves lower. This helps to maximize gains and reduce transaction costs. Important note: If your positions are small relative to your transaction costs or if you are subject to wash sales rules, this may not be a good strategy to employ. I recommend crunching the numbers for your specific situation to determine if this strategy is right for you.